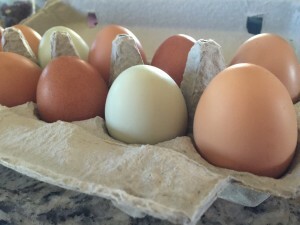 The ladies are back to their Spring schedule and are laying daily. It is a bittersweet moment when a beehive fails. It is mostly sad but the bees worked so hard to make the golden syrup that we would hate for it to go to waste. My failed hive left a completely full foundation of golden honey and several partial foundations. With a little prodding by my kids, I just couldn’t resist trying to get to that honey. I got almost a quart from just one foundation. Spring is here or so it feels like it. My condolences to all who live back east! But the bees here in Placerville, CA are busy, busy, busy! Well, at least one of my hives is. Sadly, one of my two hives was badly affected by shade, wet and cold and probably won’t make it. I’m down to a handful of bees and a queen. I suspected colony collapse a month ago when I was seeing dead bees on the bottom storyboard. Normally, the worker bees would have cleaned up but this was far too many. I’ve reduced down to one super (box) and narrowed their entry. There is plenty of honey for the meager few. So…I’d hate for it to go to waste. Maybe I’ll harvest just one foundation but I feel so guilty since they are struggling. overgrown and green. No wait, it’s a black-bottom pool that was over run with frogs and salamanders, along with wind-blown pollen and debris that caused rampant algae growth. We realized that nowhere on the property was going to escape the midday howling winds that whipped through from the west. So built the pool house to offer a wind break and our perimeter closest to the house started to take shape. Unfortunately, our free roaming chickens decided the pool was a great area too and so a temporary barn/chicken house was designed. We spent the rest of 2013 building a 10’x 20′ temporary barn out of a pole carport. And since there was more than enough room, we added two goats to the now developing farm. We purchased the five acre property and small ranch-style home in March 2011. The property backed up to the Bureau of Land Management (BLM) and had little fencing or infrastructure but lots of weeds, tall grass, manzanita, a few oak and pine trees. It was so natural the coyotes, foxes, skunks, deer and other wildlife felt completely comfortable roaming the property, even right up to our doorstep! The coyotes, however, were not the only howling going on. The late afternoon winds were wreaking havoc on keeping dirt and debris out of the pool and out of our open windows. sO most of the first year in 2011-2012 we spent repairing and upgrading the nearly 30 year old home as well as clear-cutting the overgrown trees and brush closest to the home to give a 100′ fire break. As the boys took care of repairs, chain sawing and wood chopping, mom, of course, learned how to operate a gas-powered weed eater and a backpack sprayer. We also boarded up and chicken wired an old shed attached to the house to make a temporary chicken coop. Our first six hens, now full sized, finally had a home.